Over $2000 for every $1 donated. That’s how much money the big polluters will be handed in subsidies this year for every dollar they’ve donated to the major parties since the last federal election. With devastating fires ravaging our communities, rising sea levels enveloping the homes of our Pacific brothers and sisters, and dangerous floods washing away our cities, the fact that our politicians are propping up the industry driving this devastation is simply outrageous. But it gets worse, because over the coming year, our Government will hand the big polluters $7.7 billion in subsidies . It’s easy money for the fossil fuel industry, and they know it. That’s why they keep the wheels greased by donating millions to our politicians. Since the last election, the fossil fuel industry has given $3.7 million to the major parties (at least that’s what has been disclosed), and they’ve been handsomely rewarded . It’s time for that cosy relationship to end. If we expect our public institutions to divest from fossil fuel money, it’s time we expected the same of our politicians. And that’s why, with a Federal election looming, we’re launching a campaign calling for an end to our polluted politics, an end to politicians taking money from and giving money to the fossil fuel industry. Click here to get started on the first step of this campaign – joining with Australians across the country who are calling on their politicians to go pollution free. The good news is, we are far from alone in this fight. Polling from late last year showed that over three quarters of Australians want our Government to stop subsidising the fossil fuel industry . Meanwhile, 6 in every 10 people think that the fossil fuel industry has too much influence in public debate . Everywhere you look, communities are calling for an end to the fossil fuel industry’s damaging impacts. At the heart of the this campaign is the Pollution Free Politics Pledge. It is a pledge for our Federal members to show they support an end to politicians taking money from and giving money to the fossil fuel industry. Already, politicians from a diverse range of political backgrounds have signed the pledge. These include Melissa Parke MP from the ALP, independent Andrew Wilkie, and leader of the Greens Richard Di Natale. If our politicians are serious about climate change, they should sign the pledge. Click here to join a campaign in your local electorate and begin encouraging your current MP to sign the pledge! With a Federal election on the horizon, politicians will vying for every single vote. Which is where we come in: if we are loud and coordinated, together we can make this an issue that no politician can ignore. It’s time to make Australia’s politics pollution free. Will you join us? Charlie, Isaac, and Alex for the 350.org Australia team. 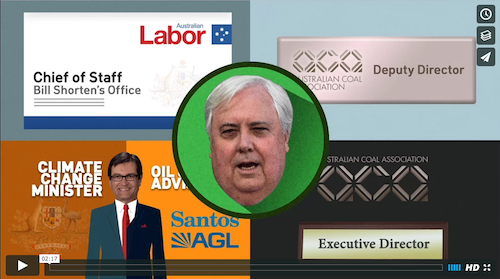 PS: Want to know who in our Parliament is working hardest to block climate action? Click here to check out our list of the biggest blockers. Hint: if you’re thinking of calling on an MP to go pollution free, highlighting these blockers could be a good place to start.